in the comparator (fig. 5-32), and seal the injector firmly by tightening the handwheel. Pull the injector rack out to the NO-FUEL position and start the comparator. After the comparator has started, push the injector rack to the FULL-FUEL position. Let the injector run for approximate y 30 seconds to purge air in the system. After 30 seconds, press the fuel flow start button to start the flow of fuel into the vial. The comparator will automatically stop the flow of fuel after a thousand strokes. After the fuel has stopped flowing into the vial, pull the injector rack out to the NO-FUEL position. 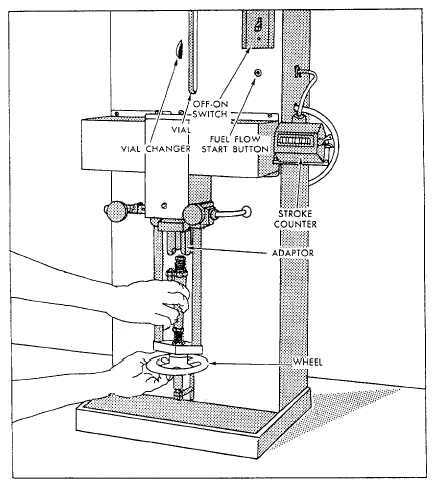 Turn the comparator off, reset the counter, and observe the reading on the vial. Refer to the chart on the comparator and see if the injector fuel output falls within its specified limits. If the quantity of fuel in the vial does not fall within the specified limits, refer to the manufacturer's manual for the cause and remedy. Any injector that has been disassembled and rebuilt must be tested again before being placed in service. To disassemble an injector, you should place it in an injector assembly fixture. Now, you are ready to remove the falter caps, springs, filter elements, and gaskets. Discard the falter elements and gaskets and replace them with new components during reassembly. Follow the manufacturer's repair and maintenance manual when disassembling injectors. While you disassemble an injector, put the injector and its parts together in a separate receptacle containing a cleaning solvent or clean diesel fuel oil. Wash all the parts and dry them. Do not use rags for cleaning. Clean out all passages, drilled holes, and slots in all of the injector parts. Figure 5-32.-Comparator used to check injector fuel output.